Culture time! Today I went out to a place called Tamaki Maori Village, which is basically a great way to learn a little bit about the maori people. They come pick you up, drive you out to the village whilst telling you a bit about the history of their people. When you do get there, they put on a cool show, which is supposed to be a traditional greeting ceremony. Keep in mind, this is new Zealand and not Hawaii. 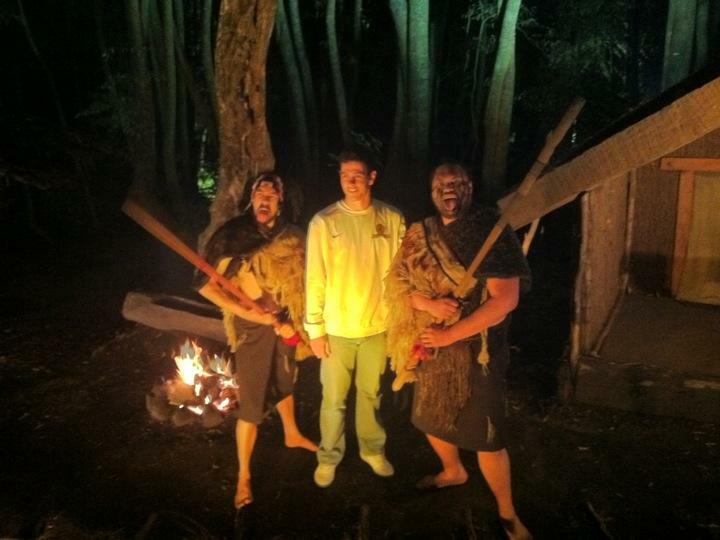 The maori where warriors, so a greeting ceremony was supposed to display their skill and scare the other dude. After that, you're allowed in to the village, where they show you a lot of what they used to do, and what everything symbolize. Really a cool experience, learning a lot and trying your hand on some things. Then, they show us how they have cooked our dinner. Simple, they just have a whole in the ground, put a fire in there, cover it with stones and lower the food down and cover it up. Then you just let it sit there for some 3-4 hours so when they un-earth the "hangi", the meat is really tender. But before dinner they had one more show to put on, taking us in to their ancestral hall and explaining about the heritage, the weaponry and the customs of the old Maori.